Himachal Pradesh has become the fifth State of the Country to launch Rajiv Gandhi Ann Yojana under National Food Security Act-2013. 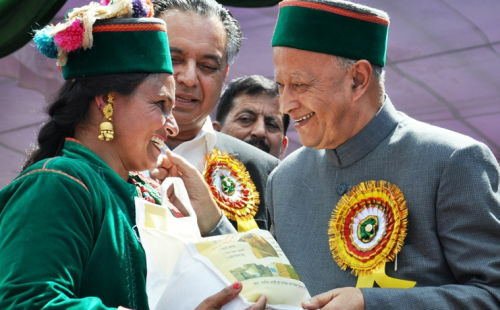 Chief Minister Virbhadra Singh today launched ambitious Food Security Scheme by handing over ration bags to 104 year old Mast Ram and 70 year old Vidya Devi of Sunni area in Shimla district, during an impressive function organized here at the Ridge. Speaking on the occasion, Virbhadra Singh said that food security was a historic scheme of the Government of India envisaged by UPA Chairperson Sonia Gandhi and Prime Minister Dr. Manmohan Singh which would ensure that nobody remained hungry any more in the country. He said that food, employment and housing were the basic needs of the common man and Congress lead UPA government had done revolutionary work by fulfilling their all three requirements. He said that every family was being provided 100 days employment under MNREGA. Chief Minister said that under Rajiv Gandhi Ann Yojana, 37 lakh people would get three kgs of wheat at Rs. 2 per kg and two kgs of rice at Rs. 3 per kg per month while Anntodya families would continued to get 20 kgs of wheat and 15 kgs of rice per month as per past practice. All the families identified under ‘Anntodya Ann Yojna’ in Gram Sabha meetings held on 7 April, 2013 would be brought under the ambit of ‘Rajiv Gandhi Ann Yojna’. Apart from it all families being covered under BPL, social security pensioners and Ann Purna Ann Yojna would also be covered it. Virbhadra Singh said that it had been brought to his notice that few well-off persons had also been included in BPL list in certain Gram Panchayats of the State. He said that the elected representatives of Gram Panchayats should be fare to their duties and do justice to the poor and needy and should not resort to nepotism. He said that a special Gram Panchayat meeting would be convened in the State and two Government Observers would supervise the proceedings of each Gram Sabha to ensure that ineligible were deleted and eligible poor were included in the list. The State Government would ensure that only eligible persons get the benefits of various Government Schemes like Rajiv Gandhi Ann Yojna and housing schemes for poor. Chief Minister said that Indira Awas Yojna and Rajiv Awas Yojna were being implemented in the State to provide houses to the poor houseless people. The State Congress Government had enhanced the grant to Rs. 75,000 from Rs. 48,500 under the scheme and 10,000 families would be covered under it during this year. Virbhadra Singh said that with a view to secure the future of educated unemployed youth, State Government had started Skill Development Allowance Scheme-2013. Under the scheme the matriculated youth aged between 18-35 years would be provided skill development allowance of Rs. 1000 while disabled youth would be getting Rs. 1500 per month. He said that providing ration at subsidized rates had always remained the priority of his Government and Food Subsidy Scheme was launched during his last tenure in the year 2007, under which every ration card holder was provided three pulses two edible oils and iodized salt. He said that consumers were being provided Moong Dal at Rs. 49.99, Kabli Channa at Rs. 35.99 and Udad Dal at the rate of Rs. 34.99 per kilogram. Likewise, edible oil was being provided at Rs. 49.99 and salt at Rs. 4 per kilogram to all families in the State. Virbhadra Singh said that State Government was bearing all financial expenses of subsidized food from its own resources. The State Government had made a budgetary provision of Rs. 175 crores for this scheme during current fiscal. Speaking on the occasion, Food and Civil Supplies Minister G.S. Bali said that Rajiv Gandhi Ann Yojana was being launched in the memory of former Prime Minister Rajiv Gandhi which was another ambitious scheme of the UPA Government after RTI, MNREGA and RTE. 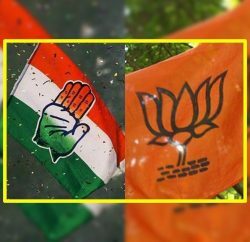 He said that Congress Party was determined to launch this scheme in the country and UPA Chairperson Sonia Gandhi remained present in the parliament until Food Security Act got clearance despite her illness. He said that over 70 percent beneficiaries had been identified under the scheme while rest would be covered soon. 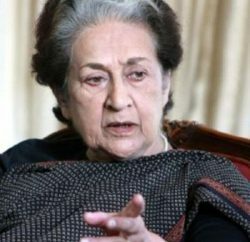 Bali said under the scheme the ration card would be issued in the name of eldest woman member of the family whereas ration card would be issued in the name of male head of the family where the female member was less than 18 years of age. State Government was keen towards this scheme and vigilance committees had been constituted at fair price shops, block, district and state levels. He said that presently 16 lakh 99 thousand ration card holders were getting the subsidized ration including APL, BPL, Antodaya Yojna and Ann Purna Yojna. Secretary Food & Civil Supplies K. Sanjay Murthi welcomed the Chief Minister while Director Food & Civil Supplies Shri Priyatu Mandal presented vote of thanks. Irrigation & Public Health Minister Vidya Stokes, Forest Minister Thakur Singh Bharmori, Social Justice & Empowerment Minister Dr. (Col.) Dhani Ram Shandil, Rural Development & Panchayati Shri Anil Sharma, Chief Parliamentary Secretaries Jagjivan Pal, Shri Nand Lal, Rajesh Dharmani and Inder Dutt Lakhanpal, State Congress President Sukhvinder Singh Thakur, Chairman 20 Point Programme Ram Lal Thakur, Deputy Chairman State Planning Board G.R. 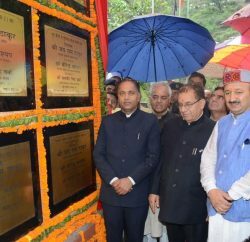 Musafir, Chairman HP State Cooperative Bank Harsh Mahajan, MLAs, Councillors of Shimla Municipal Corporation, Chief Secretary Sudripta Roy, DGP Sanjay Kumar, other senior officers and prominent people of the town were also present on the occasion.